Happy spring to you and happy blogiversary to Seasonal Eating! It’s been one year and one day since I started writing this blog, and I’d like to re-welcome Seasonal Eating readers. What better way to do this than to publish a recipe by readers’ request? These particular readers also taste-tested the “maiden voyage” of this recipe at a recent potluck. 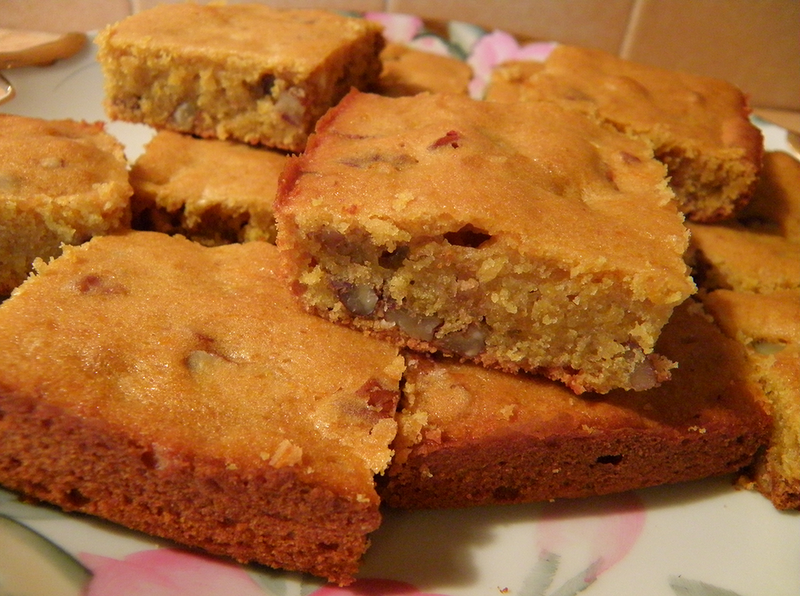 So here you go, folks, it’s Butternut Squash Blondies! I love butternut squash so much that I seldom make it any way except baked. I was pondering the old adage that squash can be substituted for pumpkin in any recipe, and the less reliable adage that persimmon can be substituted for pumpkin. I decided to experiment with an adage of my own: butternut squash can be substituted for persimmon in any recipe. To test this, I got busy with my persimmonie (persimmon bar) recipe. Most of us have eaten spicy pumpkin bars, and while they’re delicious, they remind me of fall and winter holidays. I wanted something for lighter and more like spring, closer to a classic blondie. So I eliminated the spice in the persimmonie recipe, changed the light brown sugar to dark, and substituted butternut for persimmon. Then reinforce and build up the dam with another piece of foil. Press foil firmly into pan. Butter the foil and you’re ready to pour in batter. Work with the no-nuts portion first to avoid accidental contamination with utensils. 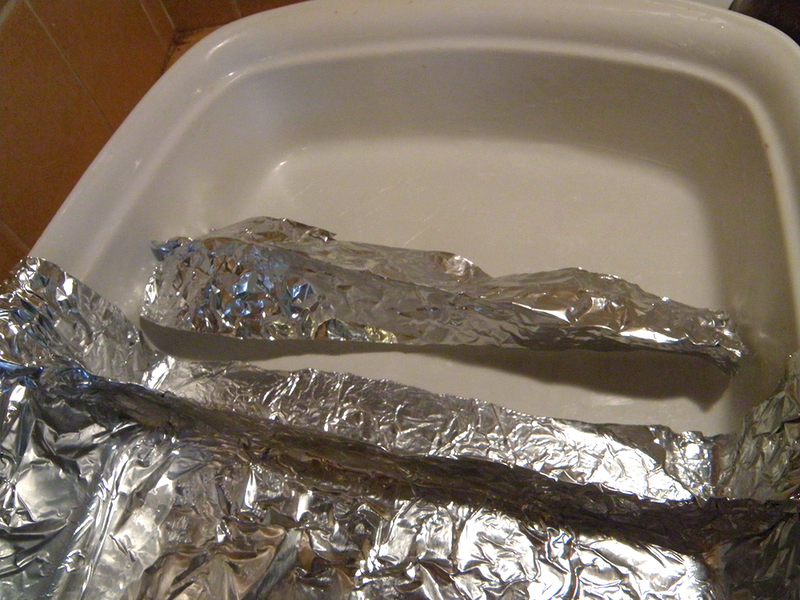 Divide the batter in half and pour half into aluminum foil area of pan. Scrape out bowl and even out the surface of batter. Then stir nuts into second half and repeat process with that half. Cut the no-nuts portion first, or use separate knives for each half. Use separate plates for nuts and no-nuts. 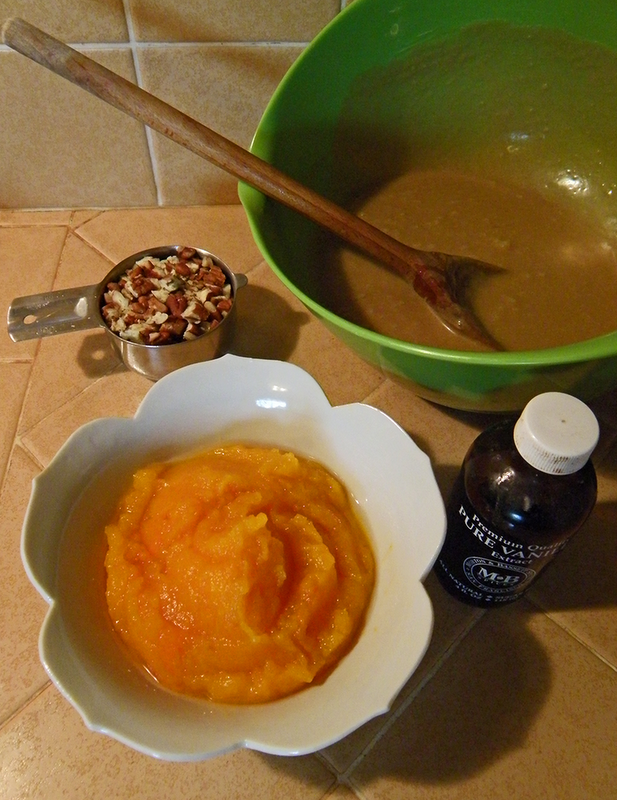 In the recipe, use 1 cup of pecans if you’re making a full batch with nuts. Use ½ cup if you’re making half and half. And, of course, the nuts are optional, so feel free to leave them out. Thanks for reading Seasonal Eating. I invite your comments, which can be posted below. Winter is gone. Enjoy your spring! Butter a 9” x 12” baking pan. 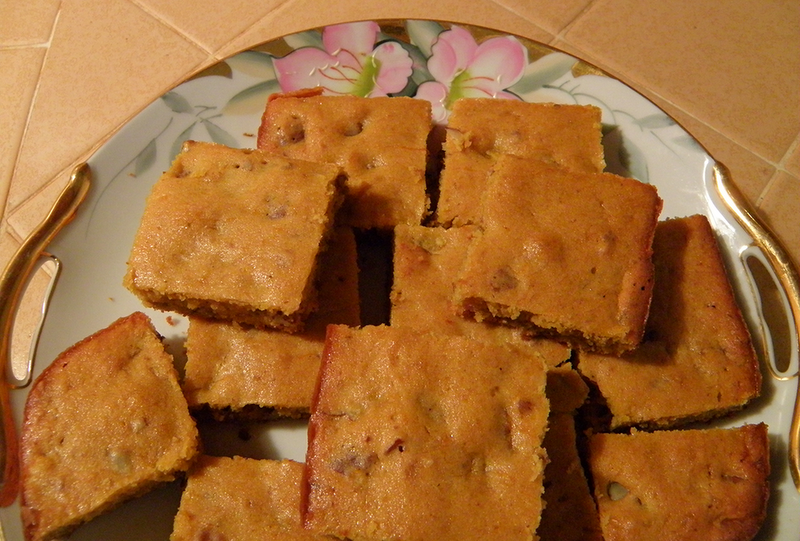 If making half and half (nuts/no nuts) blondies, build an aluminum foil dam as detailed above, and butter aluminum foil. Mash the squash thoroughly with a fork. Stir the squash with the fork until it is uniform in texture. Melt the butter. Beat in the sugar with a mixing spoon until mixture is lighter in color and creamy. Beat in one egg at a time, until mixture is fluffy. Beat in vanilla and squash. It’s easiest to use a fork. Sift together dry ingredients: flour, baking powder, and salt. Add to squash mixture and stir with mixing spoon till flour mixture is incorporated. If you’re splitting the batter into two parts, do it now and pour the no-nuts half into the baking dish, then add pecans to the nuts half. If you prefer all-nuts, stir them in now and pour batter into baking pan. Bake at 350 degrees F for 30 – 40 minutes. A toothpick inserted will come out clean when done.